In seventh pAsuram, emperumAn says “Why are you calling me out? I have revealed about me to you and eliminated all your worldly sorrows” and AzhwAr says “That is not sufficient”. Subsequently, AzhwAr says “While you remained in my heart, I meditated upon your beautiful form which you revealed to me and became free from worldly ignorance; now, I am desiring to see that beauty with my eyes physically”. Seventh pAsuram. emperumAn says “You are greatly disliking me now; Did I not do any favour for you? Do you think that I have not helped you in anyway?”, AzhwAr replies “you have done some favours; I have got a little bit now; but I am not satisfied”. ammA – Oh sarvAdhika (greater than all)! thIrndhu ozhindhEn – became free from. 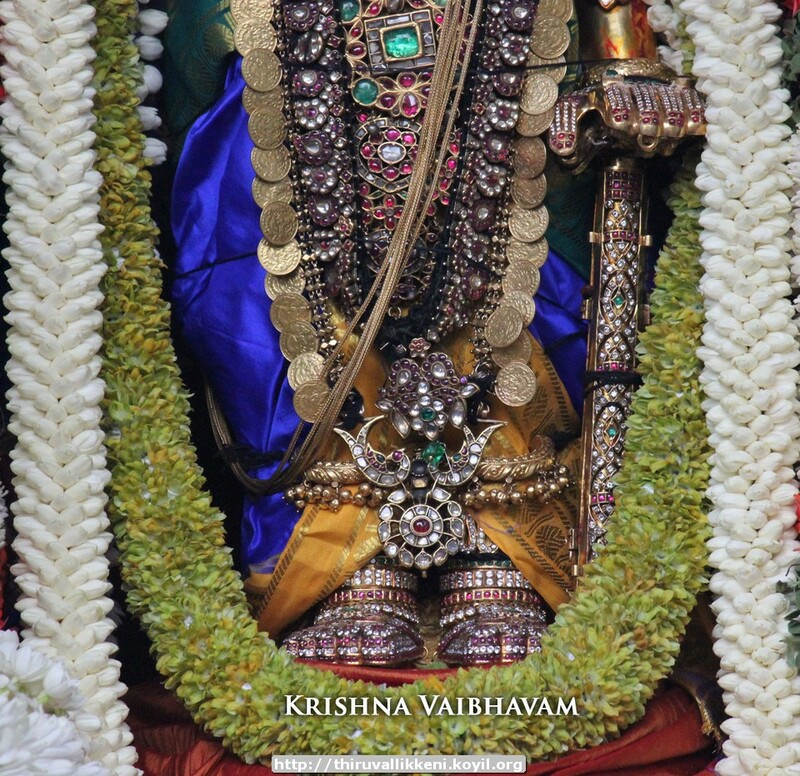 Oh sarvAdhika who is wearing divine garland which is having abundantly fragrant thiruththuzhAy (thuLasi)! I am seeing you through my heart and having clarity by the mayarvaRa madhinalam (blemishless knowledge/devotion) blessed by you, knowing you to be the prApyam (goal) and prApakam (means), placing you who is the embodiment of complete knowledge, in my heart which is substratum for my prANa, to be freed from any doubt and error, became free from the ignorance of going through birth and death and remaining to be lamenting. “I have not had the fortune of physically seeing you” is the remainder which needs to be assumed. aRindhu aRindhu thERith thERi – [First explanation – explaining it as progressive acquiring of clarity] In the [first centum] first decad, AzhwAr meditated upon emperumAn‘s supremacy; there is a clarity which is acquired when that is grasped; subsequent to that, there is clarity acquired by meditating upon him to be worshippable [in second decad], there is clarity acquired by meditating upon him to be simple [in third decad], and there is clarity acquired by meditating upon him to be tolerating the mistakes [of his devotees] [in fourth decad] and so on; in this manner only, AzhwAr’s clarity increased throughout thiruvAimozhi; all of these are mAnasa anubhavam (experience in the mind). aRindhu aRindhu thERith thERi – [Alternative explanation – explaining this in the context of artha panchakam] By your bestowing of mayarvaRa madhinalam, I acquired clarity [in the five essential principles]. para svarUpam (nature of bhagavAn) – the clarity acquired by knowing that emperumAn is as said in thiruvAimozhi 1.1.2 “… manuNarvaLavilan poRi uNarvavaiyilan, edhir nigazh kazhivinum inanilan, migu naraiyilan, uNar muzhu nalam, inan …” (bhagavAn is immeasurable by even well blossomed mind which is free of blemishes such as kAmam, krOdham, etc., that can understand the AthmA. He is immeasurable by the external senses which are used to comprehend achith (matter). Thus he is distinct from both chith and achith. He is identified as full knowledge and full bliss and has none who is equal or higher in the past, present or future. He is my sustaining soul); further knowing the ultimate state of this para svarUpam is bhagavAn‘s total dependence in his archAvathAram [on his devotees] as mentioned in thiruvAimozhi 10.6.1 “adhu namadhu vidhi vagaiyE” (his mercy is based on the desire of his devotees) and thiruvAimozhi 3.6.9 “nenjinAl ninaippAva yavan avanAgum nIL kadal vaNNan” (he who is thought about and joyfully consecrated [in deity form] is the same sarvESvaran who has ocean-like vast nature). sva svarUpam (nature of self) – the clarity acquired by knowing that AthmA is as said in thiruvAimozhi 8.8.5 “senRu senRu param paramAy yAdhum inRith thEyndhaRRu, nanRu thIdhu enRu aRivu aridhAy nAnRAy gyAnam kadandhirukkum” (Pursuing beyond different [material] entities (like body, mind, intelligence etc), unable to distinguish if it is good or bad, being distinguished and beyond the comprehension of mind); further knowing the ultimate state of this AthmA is to be totally surrendered to bhagavAn‘s devotees as said in thiruvAimozhi 8.10.3 “siRu mA manisarAy ennai ANdAr ingE thiriya – naRu mA virai nAL malar adikkIzh pugudhal – uRumO” (While the devotees who may be physically small but are great in their heart, are present here, should I seek out and reach the divine, fragrant, fresh, lotus feet of emperumAn?) and thiruvAimozhi 3.7.10 “tham adiyAr adiyOngaLE” (being the servitor of the servitors of lord). upAya svarUpam (nature of the means) – the clarity acquired by knowing that the means (process) is as said in thiruvAimozhi 5.10.11 “nAgaNai misai nampirAn saraNE [charaNau – the divine feet] saraN [SaraNam – refuge] namakku” (the divine feet of the lord who is reclining on Adhi SEsha is the refuge/means for us); further knowing the ultimate state of this upAyam is – bhagavAn‘s sahAkAri nirapEkshyam (not expecting any other support while being the upAyam) which cannot even tolerate the svIkAram (prapaththi/surrender) which is an adhikAri viSEshaNam (a quality of a person who realizes his true nature) [this implies that, even the surrender performed by the AthmA is not the means, bhagavAn is the exclusive means]. pala svarUpam (nature of the goal) – the clarity acquired by knowing that the goal is as said in thiruvAimozhi 3.3.1 “ozhivil kAlam ellAm udanAy manni vazhuvilA adimai seyya vENdum” (Being together with bhagavAn at all times, in all places and in all forms and serving him); further, knowing the ultimate state of this palam is – thiruvAimozhi 10.3.9 “undhan thiruvuLLam idar kedum thORum nAngaL viyakka inbuRudhum” (your divine heart should attain bliss and seeing that we should also feel the bliss) [More than us getting kainkaryam (and feeling joyful first – which is self-centered), his acquiring bliss is more important. As a natural result, we will also feel joyful seeing his joy]. virOdhi svarUpam (nature of the obstacles) – the clarity acquired by knowing that the obstacle is as said in thiruvAimozhi 2.9.9 “yAnE enthanadhE enRu irundhEn” (merely existing considering myself as independent and considering everything but myself as my belongings); further knowing the ultimate state of this virOdhi is – “kainkaryaththil ahankAra garbamAna mamakAram” (While performing kainkaryam, the ownership triggered by the ego) [When performing kainkaryam, it should be done for the pleasure of emperumAn and not to satisfy one’s own ego]. yAn – I who learned these by you teaching these principles to me. enadhu Avi uLLE – In my heart. niRaindha gyAna mUrththiyAyai – You who is an embodiment of complete knowledge. You who is so distinguished that I can never be satisfied with what I have enjoyed in you [and still craving for more]. ninmalamAga vaiththu – meditating upon you in the most expansive manner. piRandhum … – Immediately after acquiring knowledge [mayarvaRa madhinalam], I acquired what I prayed for in thiruviruththam 1 “inninRa nIrmai ini yAm uRAmai” (I cannot tolerate this lowly samsAram). [That is] I got rid of the ignorance which makes one die, be born again and suffer in this samsAram. naRum thuzhAy … – This is his effort to make this knowledge dawn in me. That is, by manifesting his thuLasi decoration, and making me study in that school of his beautiful form, he bestowed me knowledge and enslaved me. nAn unnaik kaNdu koNdu – I who understands your enjoyable nature, having seen your infinite enjoyability. AzhwAr is explaining the essence that he acquired “naRunthuzhAyin kaNNi ammA! nAn unnaik kaNdu koNdu – aRindhaRindhu thERiththERi yAn enadhAviyuLLE niRaindha gyAna mUrththiyAyai ninmalamAga vaiththu, piRandhum seththum ninRidaRum pEdhaimai thIrndhozhindhEn“. This entry was posted in thiruvAimozhi, thiruvAimozhi 4th centum on March 20, 2017 by Sarathy Thothathri.